Paphos Aphrodite Water Park is a water park in Paphos. It has many attractions including a lazy river, a wave pool, a leisure pool, family rafting, and many water slides. Visitors can also try scuba diving, and there are also a number of water slides and attractions specifically aimed at children, including a pirate ship, a spraying elephant, and a clown that shoots water. I have been to this water park many times while on vacations in Cyprus. It is excellent fun for all the family, especially for all but the very youngest children. Finding the park is quite easy - all over the Paphos area are signs telling you to "Follow the Frog" - go to the main hotel/tourist-area, and do exactly that - follow the signs and you will arrive at the water park. If you are in one of the nearby hotels, it may actually be close enough for you to walk to the waterpark, alternatively if you have a rented car, you can park for free in the car park, or of course you can get a bus or taxi if you wish. When you get to the park you need to pay for entrance and for your locker key. You will be given a barcoded wrist-band as well. Once inside the park, you do not need to carry any cash - simply present your wrist-band to be scanned when buying a drink, ice-cream, or food at the café, and the charge will be added to your account, which you must settle when you leave the park. In terms of facilities in the waterpark, they are excellent. The park is well-maintained, and there are many helpful lifeguards who supervise the rides, and of course ensure safety. The ice-cream stand is excellent, and there is also a café which offers burgers, hotdogs, sandwiches, etc. This is good as you will definitely need a full day at the park, and you will get hungry! (you are not allowed to bring your own food/drink into the park). Some of the water facilities in the park include (note: attractions may vary, this is what I saw there in October 2012 - the attractions haven't changed much in the past few years, but they can change). 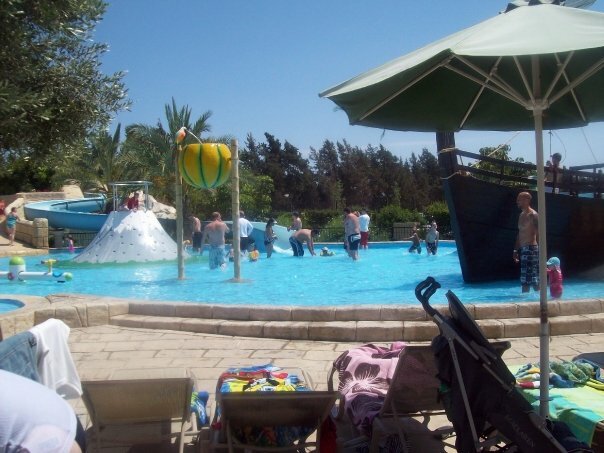 A young children's pool - this is large relatively shallow pool, with many colorful items, see-saws, water sprays, gentler water slides suitable for younger children (including ones where the child can sit on a parent's lap), a pirate ship and more. Lazy river - a long slow-moving "river" that goes round the outside of the park. You can float round the river in a large rubber ring (provided) either on your own, or with another person. Relaxing! Bouncing Ball - A very large inflatable in a swimming pool, that is sprayed with water. You (and several other people) can clamber up, bounce around, and slide back into the water. Volcano - A "volcano" in a swimming pool, which sprays water out the top. There are hand holds to climb up, but it is quite a challenge, and most people don't make it to the top or need many attempts. If you do make it to the top, there is a slide back to the pool. Water slides - There are many different water-slides including some you can go down in rubber-rings and others which just go down on your own. The steepness, speed, and level of difficulty varies. Some of them are enclosed, others are open. Stepping stones - Try to walk over floating stepping stones across a pool. Very difficult, as they move beneath your feet! A cargo net above you can be used to hold onto and help maintain your balance.